‘Sugar’ the sweet tang of it, not only a natural need for our taste buds, it has matured as an indispensable and inevitable part of our living. It’s hard to imagine the flavors without the presence of sugar, being cognizant of the adverse effects that sugar has on your well-being. Proceeding to sugar- did you knew that the table sugar which you have been devouring for so long is regarded as a poison for fitness. Now, the question is, should we stop using sugar? No, you don’t have to do that. Life would be flat without sugar, hence, we can use substitutes of sugar alternatively. Basically, all sugar is made up of only one thing, Raw sugar, the first produce of any sugar available in the market. Just the processing and refining part makes it dangerous for consumption. Calorie Count: On an average, the conventional table salt also known as granulated sugar adds 387 calories in your body on consumption of every 100 gm of it. Other substitutes of sugar contain the identical amount of calories per 100 gram. However, demerara sugar which is unrefined carries other nutritional elements, unlike granulated white sugar. Types of sugar: On the grounds of ‘fit for consumption’ there are two sections of sugar-Refined or Unrefined sugar. Refined sugar is primarily the treated sugar that is refined and processed excluding all the nutritional contents of raw sugar, just the sweetening characteristic is left. Whereas, unrefined sugar is not refined and nor processed and can be consumed by the people embracing all its nutritional contents. Sanding sugar:Sanding sugar is a little coarse in nature compared to granulated sugar. Mostly crispy and sweet, and is oftenly used as ideal sweetener for cookie or cake decoration. Granulated sugar: Granulated sugar is the white sugar used commonly as a sweetener in home, offices, and factories. More oftenly people use this category of sugar in coffee or tea for sweetness. Super-Refined Sugar: This kind of sugar is used in industries for adding sweetness in beverages and other sweet drinks. Also, this sugar is ideal for baking due to its texture. 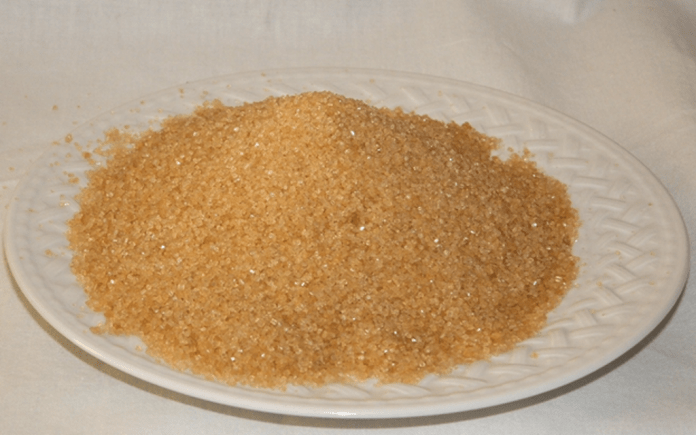 Demerara Sugar: Demerara sugar is cane sugar, manufactured from cane sugar. Demerara sugar and additional types of unrefined sugar undergo through a fewer number of the purification process. A considerable amount of lime juice is mixed with raw cane sugar to remove impurities. Contrary to that, refined sugar undergoes bleaching, centrifuge process, and contains phosphoric acid. Granulated sugar or Demerara Sugar? Which is better for health: Refined sugar is considered as a poison for health. Refined sugar are pure carbohydrate and very difficult to digest due to the varied digestion requirements. On the contrary, unrefined sugar are a good source of protein, fat, carbohydrate, sugar, and glucose- these are the essential elements to fulfill the sugar and nutritional requirements mandatory for the complete functionality of body. It won’t be a hard guess to understand that unrefined sugar like demerara sugar is better substitute of sweetness for a healthy life for you and your family.